This is Cori Gracheks first published piece, from her collection of short stories, A Place Inside. Cori Grachek was born and raised in Greenwich Village, New York City. She currently resides in Center City, Philadelphia, with her partner and her puppy. She is a Psychotherapist in Private Practice who has been working with survivors of trauma for 17 years. She runs Satya Group which focuses training and education on addressing symptoms of Trauma with Yoga. Cori has studied with Janet Mason at Temple University Center City in Philadelphia. For information on upcoming classes, click here. My mother, my mother, my mother, my God, how to explain my mother. She made the shocking mundane so that this was the baseline for my reality. Yet in so many ways the basic was lost. My mother is my greatest heartbreak, struggle, creator of many of my dreams and my initial mind opener. Though it wasnt exactly a mind opening because my mind was never closed. Growing up in Greenwich Village, in the early 1970s, where everyone was so different that people were the same. People were gay, straight or somewhere in between. Art was your greatest currency, because not just anyone could do it although it did seem as if everyone was trying. Boundaries, unfortunately for me, were a thing of the past, as this was the pre season to AIDs. 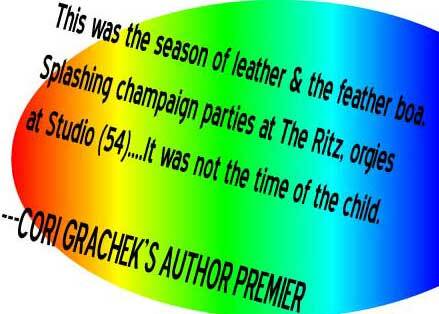 This was the season of leather and the feather boa. Splashing champagne parties at The Ritz, orgies in the VIP rooms at Studio (54), Blondies coming out at The Mudd club. My mother donned her multicolored fingernails and her biker jacket as her cameras swung dangerously from her bosom. She documented the era, myself in tow, not three feet behind. As usual. creating caves with layers of clothing. Numbing myself and forging safety with my endless reading of Nancy Drew novels into the wee hours. After having repeatedly checked the gates on the windows, I would wait to finally sleep until I heard the click of her key in the lock. I would quickly turn off the light and sigh. If I was lucky she would be alone. so close to my tears. but determined not to be the wasted talent. To give me something different or more accurately herself something different. And me? I was a part of her. She rolled me up and unrolled me as if I was an extension of her arm. In a world in which she so desperately needed to be the center and in which she never would be and therefore neither would I.
Grooming. I can remember being seven. Brushing my hair over and over until it was glossy. Preparing to go upstairs to our neighbors for a party. My cheeks were warm with the anticipation of seeing our neighbors boyfriend, Patrick. Would he like me? Would he like what I was wearing? As I picked my clothes out and laid them on the bed. My mother teasing me for my carefulness. Did she know, I think. This was my first memory of sexual abuse. I had this memory when I was 19, a sophomore in college. It is not as if I repressed them, or all of them. More that they had been floating on the periphery, waiting to be connected to a time and place when I had more love, security and understanding in my life. I told my mother, in a green garden, bustling, café in Greenwich Village, while home on break. Her response was, Oh, Yes I was sexually abused as well, by your grandmother. Talk about reassuring. I could feel myself entering that black void that I would tumble down into. The feeling of tremendous imbalance, unsupported, lost. As if I was looking in the mirror and had twice the amount to worry about when I should have been cradled, and supported from behind. It was not long after that I recalled that my mother had known I was being abused by Patrick, my 40 year old babysitter, who lived on the fifth floor of our Greenwhich Village apartment building with his girlfriend. She caught him hurting me in the back of a car on our way to the beach. Her plan for protection was to tell him to sit with her in the front and then in the months and years to come, to leave me with him and his girlfriend, repeatedly. This broke my heart. I have dealt with the backlash of this incident and this abuse for my entire life. It still affects me. I truly believe she did not know what to do. After years of screaming fights of anger I forced her to take responsibility through my sheer perseverance. She heard all of my feelings loud and clear. I fought for myself like she never did, until I could finally stop fighting. When I realized I didnt want to fight anymore, I realized I didnt have to. I learned through years of therapy to stand for myself. That I was worthy of love. And then I began to find it, in myself, my mentors, my best friend, my friends and finally in my partner. And then in the least likely place of all, in my mother. I gathered distance from her so I could actually be closer. I felt such love, which allowed me to see her more clearly. What I saw broke my heart and continues to do so. She is still that unfed child. It is hard when we surpass our parents and realize that they arent coming with us. Maybe to visit but not to stay. She whirls and whirls, the hungry child with light in her eyes and pain in her heart, not knowing exactly how to feed herself. And I, I get too close and burned. My expectations too high, unrealistic, disappointed. But when I get just the right balance, I receive so much. She is open. Pretty much open to everyone. And what experiences I have had in her care and what things that we now can share. My first manicure, at age nine, from the six foot two transvestite. And when I asked why was she so big, my mother explained That some men feel more like women inside and so they dressed themselves accordingly. Growing up racing from screenings of La Cage aux folles to events for the Rainforest Coalition, to the up and coming artists shows in SOHO. Sandra Bernharts first stand up in the east village, the American premier of Blue Lips. Flitting in and out of the Garment District with various designers trading their wares for her photos. The men of Fire Island. Lying next to my mother, as she and Rudolph design Danceteria on scraps of paper. Skating, in my permanently attached roller-skates, at age 10, through the plasticked club, prior to its opening. Watching Studio 54, and thinking Mike Myers did a really good job. His portrayal of Steve Rubel was exactly how I remembered him, seedy but exceedingly kind to a very uncomfortable, little girl. Remembering all of this first hand, my friends watch, disbelievingly, as we view a synopsis of my life on VHI I love The 70s and The 80s. She laid the arts at my feet. She pretty much did anything she put her mind to: Photographer, journalist, food critic, artist, public relations dynamo. She instilled in me the idea that I had no limits. I could accomplish anything. There was something great about this. I have lived my life believing that there isnt much that I cannot master as long as I work hard, visualize it and follow through. I have lived surrounded by beautiful, original, art. I have grown such a respect for anyone who has the guts to put themselves out there in order to create. She has formed in me a perpetual thirst for active creation. So that I am desolate and unfulfilled when I am not involved in the warm, fiery, glow of the artistic process. As an artist myself, she has been my greatest supporter. Always encouraging me to reach, complimenting me on my wit and insight. Understanding that this is seen through the bias of a mothers eye, this support has been essential to my evolution. She integrated into me the respect and yearn for all cultures and spirituality. She told me from the time I was a very little girl that I was powerful spiritually. She taught me to tap into all senses and to believe in the importance of what they received from and perceived in the world. That all life and spirit is connected. To be bewildered by my friends who are developmental neurobiologists yet cannot see the miracles occurring every day underneath the belly of their microscopes. She taught me the I-ching, to meditate, took me to celebrations of Kwanza and Native American tribal rituals. From these experiences I developed an internal calm, feeling strongly the power of connectedness. And ironically, along with all of the other ways that I have been blessed, this calm connection saved me during those dark years and fulfills me in these lighter ones. My mother still sees this world through the eyes of a wondrous child. I come home to repeated messages about the exciting events she has most recently attended or movies she has seen. She is forever calling me to espouse her views on P-Diddy (He really is such a nice, young, man.) or who she saw at the latest film festival, or who her favorite character on the L Word is. In this aspect I view the world with similar amazement. The laugh of a child. The sun tapping off the top of the glinting buildings. The whisper of hope or a smile on the day that is the grayest for your heart.